Wow you have a lot of superheroes – what are they wearing when this is all on the line? That’s fab, I can just imagine them charging around dressed as various super heroes. Do you have baddy costumes also? I love gallery pics that take me by surprise and make me laugh. This is perfect! That photo is hilarious. I have a vision of a load of naked superheroes, tapping their fingers, waiting for their washing to dry so they can fly off and do daring deeds again. Great pic. great pic! who needs plants when you have a garden full of superheros? Aw how cool is that? A fine washing line! 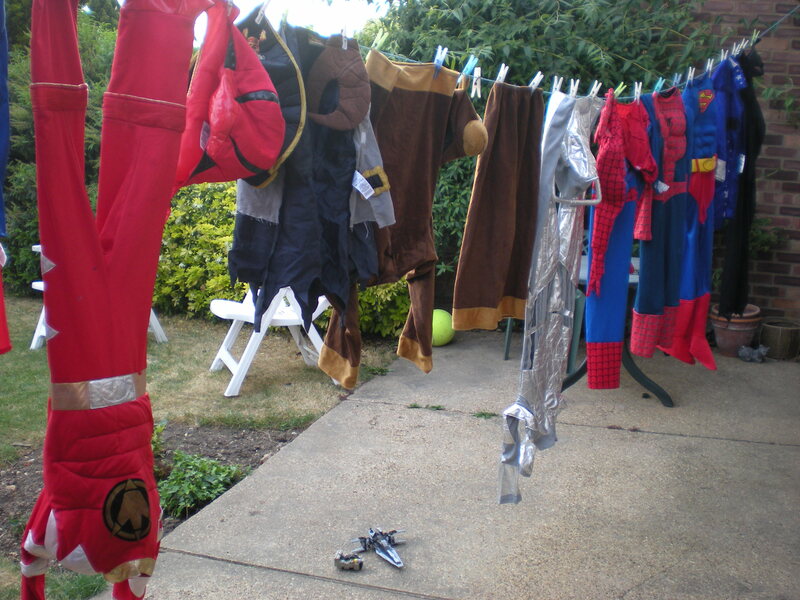 Fantastic – I love the thought of Superman et al with their costumes on the line. I hope they have spares, you never know when they’ll be called on to save the world! Ahh, I love it! Superheroes win the day! Your photograph really made me smile. You must have the world’s coolest washing line. It looks like the washing belonging to The Incredibles. Brilliant! Fabulous, saving the world from your own backyard!